Born/lived: born in 1830 in Pittsburgh. Germantown remained his primary home place, but Lambdin spent some years away, studying in Munich and Paris in 1855, Rome in 1870, and in the late 1860s living in New York City where he had space in the Tenth Street Studio Building. Known for: George Cochran Lambdin remains most known for his skill with floral paintings, especially roses from his own garden. Lambdin also painted many portraits of Philadelphia women, usually accompanied by roses whose hues matched the complexion of the subject. However, during his lifetime, he was recognized for his sentimental genre subjects, including American Civil War scenes. 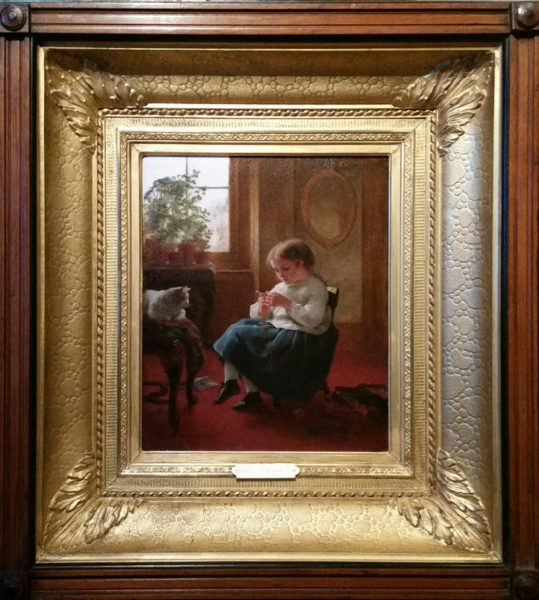 Studied: the son of James Reid Lambdin, a successful portraitist from whom he received his early artistic training; also Munich and Paris and Rome. Member: National Academy of Design. Exhibited: the Pennsylvania Academy of the Fine Arts; the 1867 Exposition Universelle in Paris. Work: At his family’s home when he was a young man, he began the cultivation of flowers that subsequently influenced his oil paintings and resulted in images which Louis Prang and Company of Boston converted into chromolithographs. Comments Exhibited in 1860, no. 269, in The Annual Exhibition record Pennsylvania Academy of the Fine Arts. Exhibited in 1860, no. 269, in The Annual Exhibition record Pennsylvania Academy of the Fine Arts. This painting is in excellent condition, in the original period gold frame also in excellent condition.